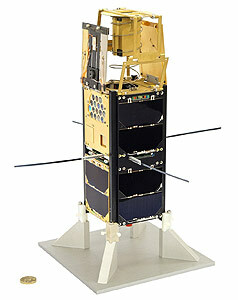 VZLUSat 1 is a Czech 2U-CubeSat mission built by VZLÚ to test several technologies in space and to take part on the QB50 mission. VZLUSat 1 carries following experiments. Miniaturized X-ray telescope consisting of the Timepix pixel detector for X-rays images in energy range 3-50 keV with 256 × 256 pixels and a deployable X-ray optic, which is used as a Lobster eye optic (LE) system for the soft X-ray region (5 – 20keV) and as a collimator (Soller slit) for the hard X-ray region above 35 keV. As a payload for QB50, the satellite carries the Flux-Φ-Probe Experiment (FIPEX) of TU Dresden, which is able to distinguish and measure the time-resolved behaviour of atomic and molecular oxygen as a key parameter of the lower thermosphere. Atomic oxygen is the dominant species in these regions and therefore its measurement is crucial in the validation of atmosphere models. The satellite is one of six QB50 science satellites, which were to be launched on a Dnepr rocket on the QB50-DS flight. As the availability of Dnepr has become doubtful, they were transfered to an Indian PSLV-XL launch.